Digipath Inc (OTCMKTS:DIGP) investors have reason to be excited with the slew of recent developments and announcements. The company is making big headways into the cannabis testing industry while growing revenues significantly and signing several agreements with companies. The stock surged over 50%+ during intra-day trading on significant volume. Volume easily surpassed its daily average volume by over 5 times its average. In recent developments, Digipath Inc (OTCMKTS:DIGP) has been signing several testing agreements over the last few months with over 3 signed (Waveseer, House of Herbs, and Silver Sage Wellness). DIGP was recently awarded a license to open a testing facility in Colorado. It is estimated that the cannabis testing market will reach almost $1 billion by 2020 and will process over 5 million pound of cannabis. The company has a competitive advantage due to its robust laboratory procedures, quick turnaround time, close relationships, and addition services. DIGP’s goal is to expand by replicating its success in Nevada across other states where the drug has been legalized. DIGP announced its first quarter 2016 results recently. Net sales quarter of quarter surged over 2,000%+. It has been signing new exclusive agreements rapidly which should propel revenues even further. The company has decreased its cash use by almost $1 million in 2014 and reduced its net loss from $0.30 per share to $0.12. According the recent announcement, DIGP needs additional capital to fund its short-term operations and is currently exploring potential financing opportunities and will seek to further reduce its costs. Since DIGP testing facility in Las Vegas, Nevada, the company has completed over 500 samples. This makes the company a leader relative to its peers. The company has signed over four new exclusive agreements since last quarter. DIGP is well positioned for the exponential growth expected to be seen by the marijuana industry which is poised to reach $40+ billion by 2020. In a report by Bank of America, it singled out cannabis testing as an area likely to experience enormous growth within the industry. The report suggests that cannabis testing could reach $800 to $900 million in size by 2020, as the $2.9 billion medical cannabis industry appears poised to at least double. Cannabis testing services and lab equipment should experience heightened demand as the industry matures. DIGP was incorporated in Nevada on October 5, 2010. DigiPath, Inc. and its subsidiaries supports the cannabis industry’s best practices for reliable testing, cannabis education and training, and brings unbiased cannabis news coverage to the cannabis industry. DigiPath Labs, Inc. plans to set the industry standard for testing all forms of cannabis-based products using FDA-compliant laboratory equipment and processes to report product safety and efficacy. DIGP is currently trading at a $2 million market valuation. The company has seen a surge in revenue growth and signing new exclusive agreements with clients. With the right momentum, the stock could be poised to double or triple from current levels. The entire industry is getting a significant lift. One concern is the fact the company will need to raise capital. 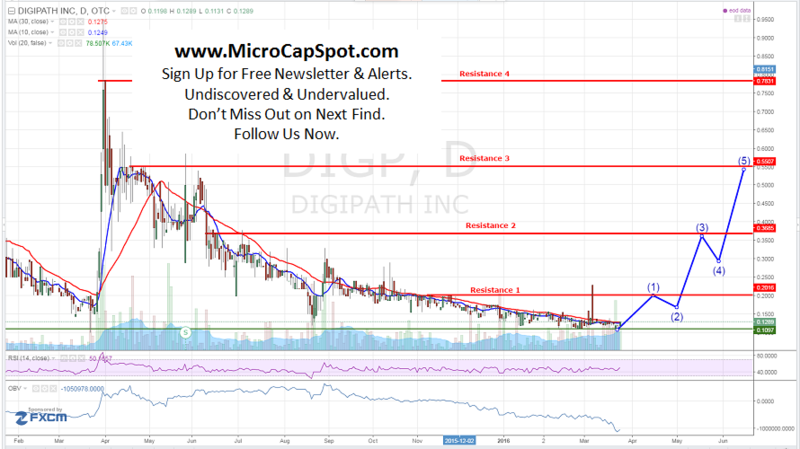 We will be updating on DIGP when more details emerge so make sure you are subscribed to Microcapspot so you know what’s going on with DIGP. Disclosure: we hold no position in DIGP either long or short at the publication of this article and we have not been compensated for this article.